I have just finished an update and consolidation of the 9000 Series Pantera Registry, and so I thought my revised calculations of GT5 and GT5-S production numbers might be of interest. The GT5 debuted at the Turin motor show in 1980. The first factory noted GT5 is, according to Matt Stone and Rob de la Rive Box, 9250. Matt and Rob state, in their book Pantera Buyers Guide, that prior GT5s were probably recorded as modified GTS units. Franz Krump has also written that the Turin motor show car was 9250. So, in short, 9250 is one of two options for the VIN to consider for the GT5 start. 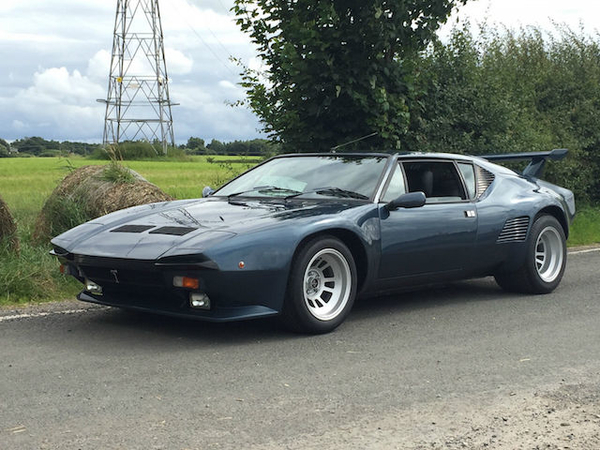 However, so far I have found 35 GT5 cars with VINs lower than 9250 (the earliest Pantera GT5 I have on record is 9107) and I am not sure how reasonable it is to assume they are all conversions. 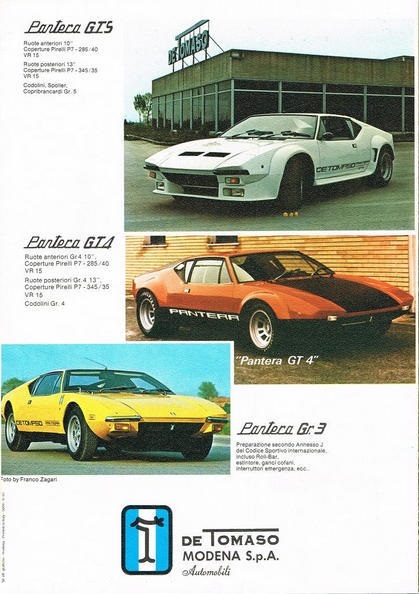 I have been able to identify seven allegedly 1979 Panteras with numbers higher than 9100, and we know the GT5 model debuted in 1980, so I think it is reasonable to assume that no GT5 will have a lower chassis number than 9100. So, in short, I believe 9100 is the second, and better guess, of two options for the VIN to consider for the GT5 start. The last GT5 in the official production run is 9374, built in 1985. There were more GT5 Panteras built as special orders after that, but only two are known, these being 9517 and 9542. As the GT5-S registry becomes more complete, it is increasingly less likely any more will be found. If you add the two special order cars, a total of 126 could have been produced. Next, we have to subtract the 8 other model Panteras built between these two VINs. The first GT5-S is known to be 9375, a 1985, and the last is the last GT5-S is 9562, a 1990. The number is likely to go down as we find other models of Panteras with chassis numbers within the GT5-S range but, for the time being, 182 is the best estimate of the maximum total number of GT5-S Panteras that could have been produced. • This category includes L, Gr3, GT4, race cars and indeterminate cars. Going by VIN numbers, there were a total of 602 Panteras in the 9000 series. That means I am still missing 286, or 48%. Without the vendors and the factory making their records available, I expect finding many more will be difficult. There are whole regions of the world where I know there are a lot of cars, but that are seemingly impossible to get information from. The Middle East, South Africa and Japan are the big ones. Nice work and very informative Peter. Just looking at the few VINs that Peter provided on ProvaMo is very interesting. Lots of very cool pictures and information about these special cars! Thank you Jimmym and Rocky. The 9000 series registry now contains many, many thousands of photos adding up to over 10GB of data. What you see on the ProvaMo registry website is just the tip of the iceberg because of space limitations and privacy considerations. Some years ago I grappled with the question of how to make it more widely available to the DeTomaso community, but could not come up with a solution that would not be a full time job. I have had to satisfy myself with just making it available to the few historians among us. POCA, PI, UKDTDC & Svenska De Tomaso Klubben, all of whom have endorsed my registry, will also have copies in case I get hit by a bus. A copy of the index to the registry is available on the members-only side of the POCA web site, by the way. It is usually not up to date because I forget or don't get around to sending it to the web master that often, but it is still useful in giving you some idea of where the known 9000 series cars are in the world today. I hope people appreciate just how much work Chuck puts into the ProvaMo registry web site, because I can tell you just tracking the few cars that I have and merely compiling the information into files without processing it is a massive time commitment. For Chuck to have tracked information on several thousand cars as he has, and then single-handedly processed it to write up entries that can be posted publicly without causing privacy concerns, not to mention building and maintaining his website, is nothing short of a wonder. I really don't know how he does it. Thanks so much for the info Peter. Super informative. What I find interesting about your data is that it is possible that there are fewer GT5 than GT5S'. It confirms what I noticed when I was searching to buy a late model Pantera in the US. Which was that it was easier for me to find a GT5S than it was to find a GT5. Your observation coincides with mine and that of many others, ND4SPD. GT5 Panteras are more rare if we go by the cars offered for sale over time, or if we go by the numbers I have been able to find for the registry (90 GT5 vs. 118 GT5-S). The relative difficulty in finding GT5 Panteras may simply be a reflection of the greater tendency of the owners to keep their cars locked up out of sight and to never sell them. Or perhaps they were crashed and written off at a higher rate. Without the factory records we just do not know which VIN to start counting from. My starting to count from 9100 is just an educated guess, and the only evidence I have for the first factory-recognized GT5 being 9250 is the reference in the Matt Stone and Rob de la Rive Box book. I am starting to be a bit sceptical about the Stone and de la Rive Box assertion for two reasons. 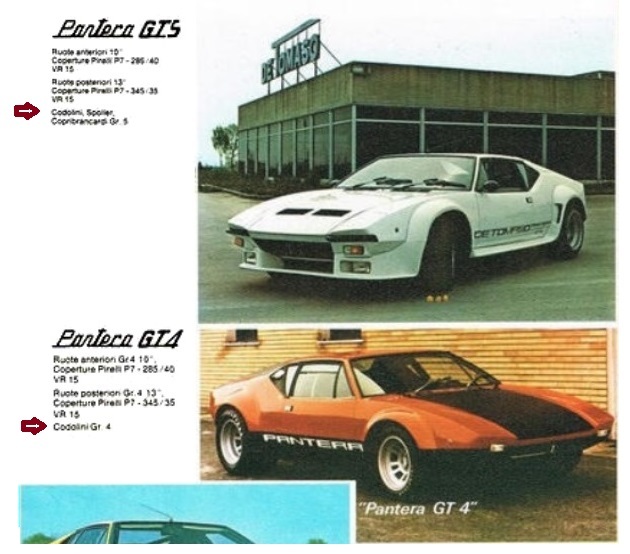 First, I have found so many Panteras between 9100 and 9250 with the GT5 body style that it is becoming hard to believe they were all conversions, or that the factory built so many re-bodied GT4s before deciding to start giving them a new model designation. Second, I personally inspected and photographed 9250 in Australia, and it bears no resemblance to the first GT5 that we know had its debut at the 1980 Turin Motor Show. This is why I have concluded that, for the time being, 240 is the safest number to use as the maximum number of GT5 models that could have been produced. Hopefully more information will be revealed over time so we can be more definitive. Here is a photo I took of 9250. It is a right hand drive car reportedly imported into Australia by Paul Halstead's company De Tomaso Australia, and owned by his retail outlet The Toy Shop until being sold to the present owner. 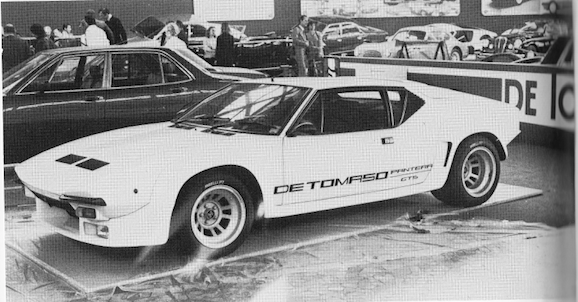 De Tomaso Australia was that country's Amerisport. Halstead earned export credits by selling Australian 351C engines to De Tomaso in Italy, and those export credits allowed him to import Panteras minus the engines. He then installed the Australian engines in them and sold them through The Toy Shop. Great work, Peter! Do you happen to know how many GT5-S cars on your list are also Amerisports? I once asked Kirk Evans and even he (the actual builder) didn't know! His estimate was 'less than 50'. I have only noted 14, but I am pretty conservative - unless I see an Amerisport badge in the photos or have some other evidence, I do not record a car as an Amerisport. Just because a car has an Amerisport wing, or gills, for example, is not sufficient evidence for me because those can be retrofitted. Kirk did promise me a few years ago that he would go through his records, which are buried somewhere in his home, but he has not done so yet. He is a very busy guy. I might give him a call by way of friendly reminder. Peter, how many 9000 serial numbers were unused? I've always wondered why there always appear to be more GT5-S cars "around" than GT5s. This thread could shed some light onto the subject. I have only 14 that are positively identified as Amerisports. Kirk still has his records, but he told me they are buried and it would take a lot of time to dig them up and go through them. The last VIN in the Pantera run was 9641, which is the De Tomaso museum 90 Si. Has anyone confirmed concretely that all the numbers were used? It was very typical of the Italians of the era to skip serial numbers. It is likely that all of the 9000 series production numbers are lower than what has been considered possible. Thank you for the effort and research...very interesting subject. As far as I know only the numbers 9563 to 9600, inclusive, were not used. I have 9555, second to last built. Sera Blue. Thanks for the update, Jack. Did you acquire it from Steven Phillips in Lancashire in the UK? Gorgeous car Jack, I like the dark blue, the only color I like better than silver. What color is the interior (it looks black in Peter's picture)? Congrats on 9555, a beautiful machine for sure. The 9000 series registry is now up to 423 of the 603 known late model Panteras (Maggiora Carrozzeria and Embo Carrozzeria). This means we now have just over 70% catalogued. I thought this was as good a milestone as any to re-run the production numbers, so I did that today and was surprised to find that the number of GT5-S cars that could have been built has not changed much, but the number of possible GT5 Panteras has dropped dramatically. Conversely, the number of narrow bodies built in the 9000 series has jumped substantially. I have been able to confirm that at least 8 L model Panteras were built in the 9000 series. All of these were Maggiora coaches except #9158, which was a 1980 Embo car. At least three base model Panteras were also built (ie with no model designation from the factory than just “Pantera”), all Maggiora cars. I have been able to identify 37 GTS cars during the Maggiora period (this is probably a very low number and I expect to find many more with time), plus 80 during the Embo period for a total of 117 late model GTS Panteras with 9000 series VINs. There is also a smattering of one-off and “speciale” cars, with designations such as GT4 Stradale, Gr3, GTS/4, GTS Gr 3, GTS/4 Gr.3, GT5 Gr.3, and so on. Also of interest is #9600, which is noted by the factory as a 90Si but is in fact a GT5-S body with prototype 90 Si mechanicals. The GT5 debuted at the Turin motor show in 1980. Determining the exact number of GT5s produced requires knowing, as a starting point, the first and last VINs. However, because no one except Phil Olczyk, as keeper of the factory records, knows the VIN of the first official GT5 and he has declined to reveal it, I have been greatly handicapped in this exercise. Matt Stone and Rob de la Rive Box thought the first “factory-noted” GT5 was #9250. In their book Pantera Buyers Guide, they wrote that prior GT5s were "probably recorded as modified GTS units from about late 1980". However, factory records prove this is incorrect because #9250 has been confirmed to have been a 1982 car exported to Australia and assembled there, and a number of factory-noted GT5 Panteras are known to have been built with lower VINs. The earliest factory-noted Pantera GT5 I have on record so far is #9127, which is a 1981 RHD located in Australia. However, many cars are still missing from the registry and an earlier one could pop up at any time. In short, we can only speculate about the start of GT5 production. That said, it is highly unlikely that GT5 production would have started with Maggiora Carozzeria given the troubled nature of their relationship with De Tomaso. The best guess is that De Tomaso switched coach makers to Embo Carozzeria with VIN 9100, and I think it is reasonable to assume that no true GT5 will have a lower VIN than that. I know that #9100 is a GTS, but I have not been able to document #9101 and so, on the reasoning above, that will be the first possible GT5. The last GT5 in the official production run is #9374, built in 1985 (we know this for a fact because the next VIN up was the first GT5-S). However, there were more GT5 Panteras built as special orders after that, although so far I have only found two (mine, #9517, which was a 1989 model year and #9542, a GT5 RHD currently being restored in the UK). This number could go down if I find more non-GT5 Panteras with chassis numbers between 9100 and 9374, and it could go up if I find more GT5 cars with VINs above 9374. The number may go down if I find other (non-GT5-S) models with chassis numbers within the GT5-S range but, for the time being, this is the best estimate of the maximum total number of GT5-S Panteras likely to have been produced, and I expect it to stay relatively stable because of the high percentage of the GT5-S cars that I have been able to find. Thank you to all the people who have helped with the detective work required to get the registry across the 70% threshold, including Mike Drew, Julian Kift, Rob Covey, Chuck Melton, Franz Krump, Charles McCall, George Pence, Jack DeRyke, Kirk Evans, Rene Killer, Pat Hals, Mark Charlton, David Berman, Claude Dubois, Simon Vels, Joe Nardo, Roger Brotton, Roland Jaeckel, Kjell Jansson, Mark Reber, Chris Beck, Masayoshi Mitsui, Michel Savard, Denis Caron, Gerry Romack, Marcel Schaub, Phil Stebbings and Lashdeep Singh. Please keep those tips coming, gentlemen! Phil Olczyk has reached out to me to express concern regarding what I wrote about him above, and so I would like to clarify my comment that he has declined to assist with establishing the VIN of the first GT5 using the factory records he has acquired. While what I wrote is true (Phil advised me on January 27th that he will not continue to help without being paid), I should have acknowledged that he had previously provided some information from his files, both here on this board and in private correspondence with me. Although not relevant to the question of the first GT5, his information was otherwise helpful and so I do owe him thanks for that. The fact remains, however, that the answer to the question of the first factory-noted GT5 is in the factory records that Phil is selling and, until and unless he volunteers that answer (or until some wealthy benefactor agrees to pay him), we may never know with 100% certainty. Thanks to forum member LarryW for pointing out to me that not counting #9000 affects my totals. I should have explained that there is evidence that De Tomaso started the 9000 series with #9001. However, while not counting #9000 does not affect the total, there was a #9375 for the GT5-S calculations which Larry is correct that I should have added to the GT5-S total, and so I have fixed my math accordingly. I made the same error in my GT5 math, but it does not affect the total because #9100 turns out to be a confirmed GTS. Thanks for your sharp eye, Larry! I used to own 1985 GT5 9334. Legendary Motorcars purchased it from me and it was recently sold. Not sure where it went. I still have most of the ownership documentation. Wonder wwhat they were asking for it. And two GT5 cars coming up for sale from Guy Anderson's stable at Mecum Indy in May, sure would be good if anyone is attending to get VIN details to help Peter out! From the 'Official 40th Anniversary 1959-1999' booklet handed out to event participants. Produced by the DeTomaso Factory (black cover, 3/4-rear view of a Pantera GTS on front, photo of a Pantera GTS on the old factory assembly line in Modena. 24 full color pgs). "Pantera 1970-1990: about 7260 built (includes narrow body GTS, GT-5 and GT5-S plus 'Pantera' 1990-1992 (the factory never used 'si' to describe these last cars) ; about 38 of these built". Note- no factory official totals except for all Panteras lumped together, and even that number is approximate. 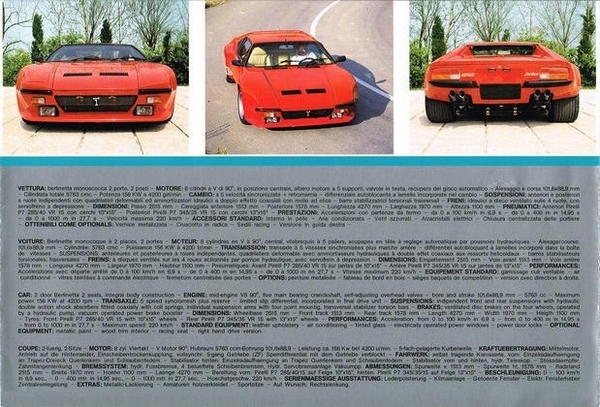 The last batch of what some call 'Pantera SI' were sufficiently different that the Italian Gov't forced DeTomaso to re-certify it with a crash test. It also has a different Tipo number). Not in the booklet- three GT5-S cars were factory-converted to Targa type tops. Of the 3 known Targa-Panteras, two were built with Getrag 6-speed transaxles sourced from the Audi RS-2. One is Austrian Franz Krump's 'cirrus-blue' Targa-Pantera; the other is a yellow Targa in Switzerland). A single non-Targa GT5-S was also equipped with a six-speed Getrag. 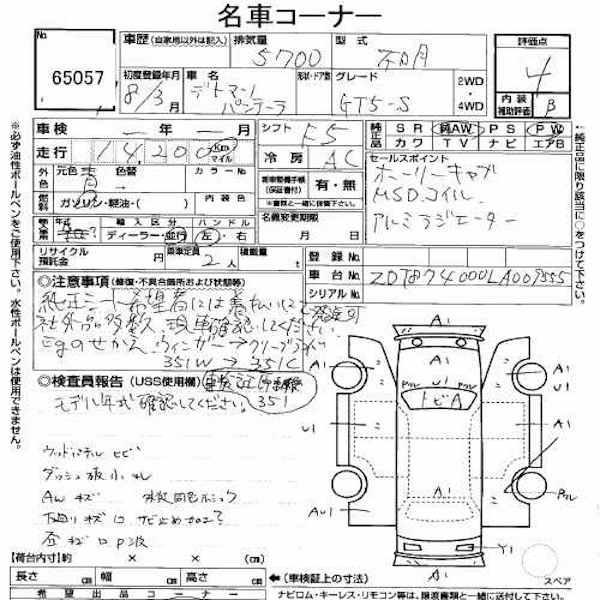 A 3rd Targa-top GT5-S apparently had a std ZF 5-speed. I think you mean Si and not GT5-S ? from what I remember there are 4 Si Targa's . 1 red, 1 blue , 1 yellow and 1 gold painted. Peter many years ago you and I discussed a red "GT5". I believe it was in Spain. It may have belonged to a forum member. Or it may have been for sale on eBay. I really don't remember any longer. I've searched my records for a picture of it, but came up empty handed. I'd be surprised if you didn't retain some information about it. The unique thing about the car, it had factory original GT5 body work, but the factory ID plate on the foot box described it as a GT4. The red "GT5" on the cover of Jan Norbye's book is described on page 72 of that book as a GT4. That Pantera in Spain could have very well been the Pantera on the cover of Mr. Norbye's book. 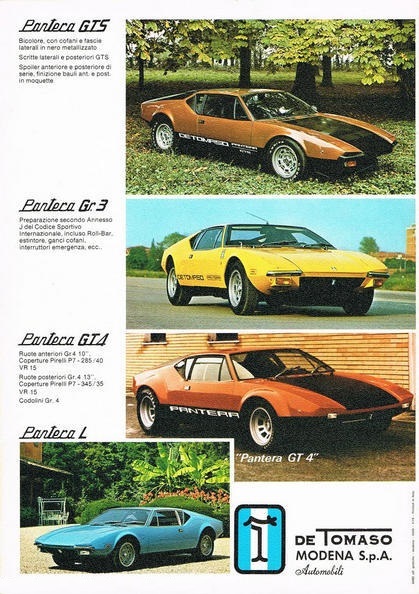 From 1978 to 1980 wide body Panteras came on the scene and evolved from a "wheel, tire, and fender flare" option for the GTS (1978), to a unique model so equipped (1979), and finally to the unique GT5 livery displayed in Turin in 1980. The red Pantera, by its existence, proves that the evolution of the livery outpaced the evolution of the name. I don't know if in your mind the first GT5 is the first Pantera called a GT5 by the factory, or if its the first Pantera built with GT5 livery. Either way, I doubt there were many Panteras like the red one. That Pantera's chassis number would have pointed you within a few chassis numbers to the "first" GT5, however you define it. If there is any car more unique than a GT5 its a GT4, which is also an Embo coach (9000 series) model. Another page from the same 1976 brochure. 4 Pantera versions marketed. Unfortunately no 1977 or 1978 brochures were available to me. Below is a page from a 1979 brochure; still 4 Pantera versions marketed. The Gruppo 4 has conspicuously been renamed a GT4. 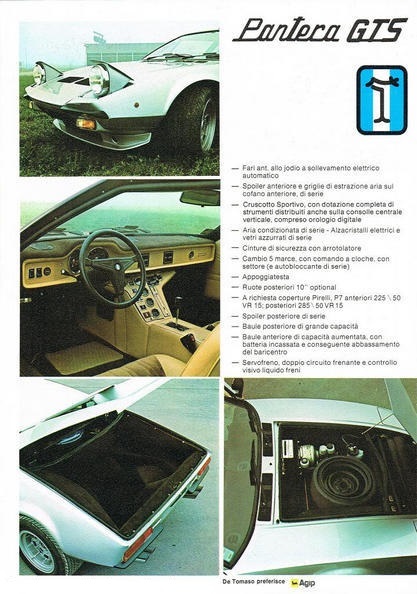 It would be natural to assume the GT4 and Gruppo 4 were the same car; after all they used the same picture in this brochure that had been used in earlier brochures. Except we know for a fact De Tomaso produced for a short time circa 1979 wide body street cars, based on the GTS, which they referred to as GT4s. 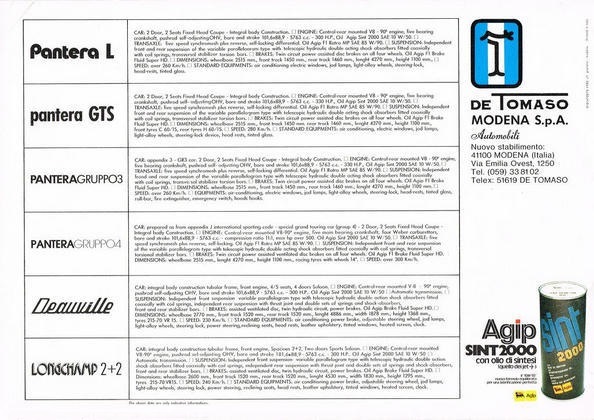 So instead of the "Gruppo 4" being renamed, what in reality transpired in the 1979 brochure was the GT4 was "added" to the line-up and the Gruppo 4 was dropped from the line-up. 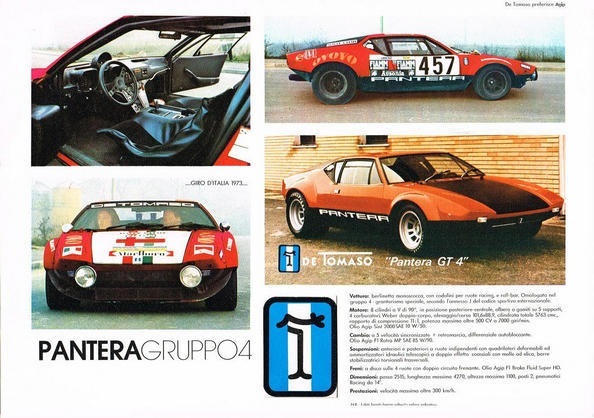 Without 1977 or 1978 brochures its impossible to say exactly when the Gruppo 4 was dropped. In the small print the GT4 tires are described as Pirelli P7s, not racing tires. This car of course had 285mm front and 345mm rear street tires. The widest street tires ever manufactured. Porsche and Lamborghini were doing the same thing at the same time. Below are two pages from a 1980 "GTS" brochure. There's lots of detail information about the GTS. The other Pantera models receive an "also mentioned". There are still 4 versions of the Pantera being marketed. The GT5 makes its first appearance, and the GT4 is still there too. The Pantera L has been dropped from the line-up. Unfortunately I don't have a 1981 brochure available to me. I'd bet mention of the GT4 was dropped in 1981. Below is a better view of the 1980 brochure, you can read the blurb about the tires a little better. Not a lot better, just a little better. By the way, can anyone explain to me what's the meaning of the word pointed out by the red arrows? Finally below are two pages from a 1985 brochure, the next brochure available to me. 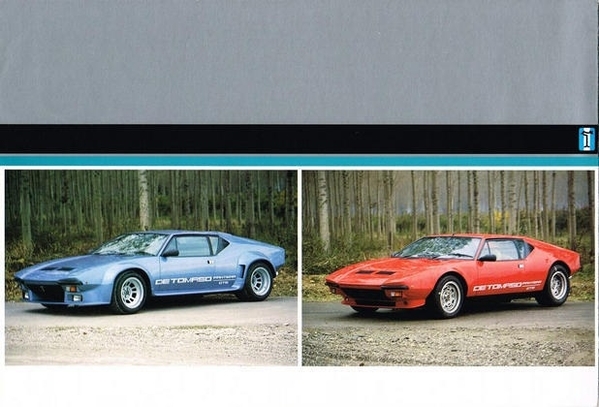 By 1985 only 1 Pantera model is really advertised; the GT5-S. The GT5 and GTS are pictured, but there's no information provided about them, no specs. Its as though De Tomaso was showing pictures of the "out going" models. There's no mention, not even a picture, of a Group 3 model. This means the total possible production of the GT5 is now down to 197.